Dear Bessie finished her story today. A story that spanned 14½ years. She became ill just over a day ago while I was on my way to the Lake District. Mum called me back home because she knew it was serious this time, “I think she’s dying Mike”. Her last day was painless as her body failed and finished just before 11am by the vet. She spent most of those years in this house and witnessed all the changes that occurred over those years. The first day when she was tentatively introduced to us, she ran, full of excitement in figure-8s in the garden. She had a bit of a silly poodle haircut, bouffant & bushes. I clipped off most puffy bits fairly quickly. She didn’t like too much physical contact, at first pulling away from a head stroke. She got used to us eventually. Though she grew old and slowed dramatically in the last few years, she was always the gentlest soul. A good dog to have in a house of boisterous children. She took with her a story of change, human relations, growth and separation. The last four years the house became calm which coincided with her more restful pace. She has also taken the mysterious prologue- the time before she came into our lives. I know very little of this period in 1997. I do know, however, that she recovered from a bout of Parvo’s virus. Other than that, her time before Bessie’s dynasty is blank. I’m trying to decide, from all the options, where to scatter her ashes. 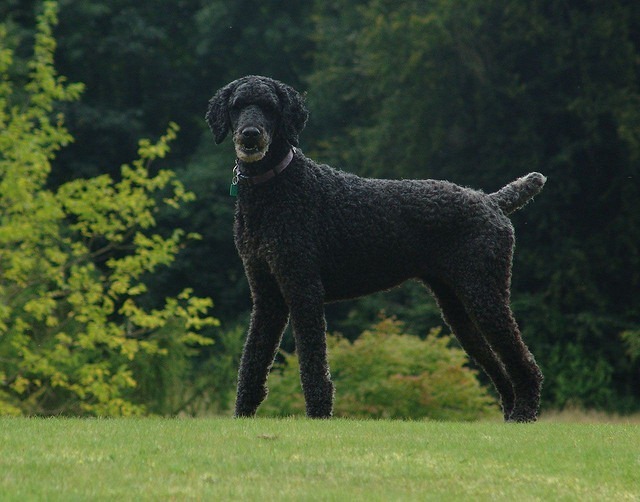 This entry was posted in Dogs, Home and tagged Bessie, Poodle. Bookmark the permalink.